A misted-up windscreen is one of the most irritating parts of winter driving. If you find yourself battling with the heater controls in a bid to clear the fog from the glass, you’re not alone. But what’s the best way to demist your windows and clear the condensation in as quick a time as possible? It’s a difficult question as there’s so many settings that could affect it and everyone has a theory on the best course of action. The heater, air-conditioning, re-circulating control, and even the windows can all play a part in how quickly your windscreen clears. It’s an important one too – driving with a fogged-up windscreen can be very dangerous, as it can reduce visibility. • Turn your air-conditioning ON: Air-conditioning dries out the air before it leaves the vents – so it’s then able to absorb more liquid. • Turn OFF air re-circulation: The air outside is cold – so doesn’t contain as much water vapour. Bringing it into the car will aid demisting. • Open a window: Again, this brings in the dry air from outside – ready to be warmed up and absorb moisture. You don’t need it all the way down, just a crack will do. • Stand outside the car: Your breath is warm and wet – and doesn’t help the demisting process. It’s best to be careful though. Don’t just abandon the car with the keys in to demist on its own – stay by the door at all times. Following these steps will get you on the road as quickly as possible on those chilly mornings. Of course, sometimes the automatic systems just do it better – many modern cars have a ‘demist’ button, or even a heated front windscreen that will do the trick in moments. There’s also a few of these tips that should be taken sensibly – if it’s raining outside you might not want to open a window, for example! There are a few other tips you might want to try as well. Many companies sell anti-fog liquid that stops the windows misting up in the first place. 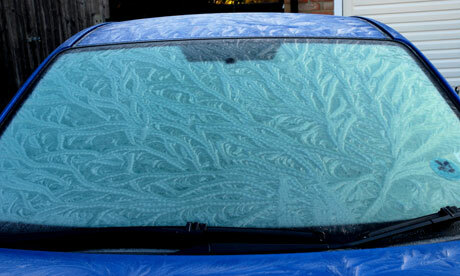 A cheap alternative to this is to rub your windows with shaving foam – which seems to work just as well. Another trick is to stop the car getting humid in the first place. It’s possible to buy dehumidifiers which absorb the moisture before it hits the windscreen. Or, if you’re on a tight budget, try filling up an old sock with cat litter and tying off the end. Whichever approach you choose, remember not to move off until your glass is clear. It’s dangerous and if your visibility is impeded, it’s illegal.